Neither graceful nor beautiful, warthogs are nonetheless remarkable animals. They are found in most of Africa south of the Sahara and are widely distributed in East Africa. They are the only pigs able to live in areas without water for several months of the year. By tolerating a higher-than-normal body temperature, the warthog is perhaps able to conserve moisture inside its body that might otherwise be used for cooling. (Camels and desert gazelles have developed a similar mechanism for survival in hot, arid environments. Males weigh 20 to 50 pounds more than females, but both are distinguished by disproportionately large heads and the warts-thick protective-pads that appear on both sides of the head. Two large pairs of warts occur below the eyes, and between the eyes and the tusks, and a very small pair is found near the jaw (usually just in males). 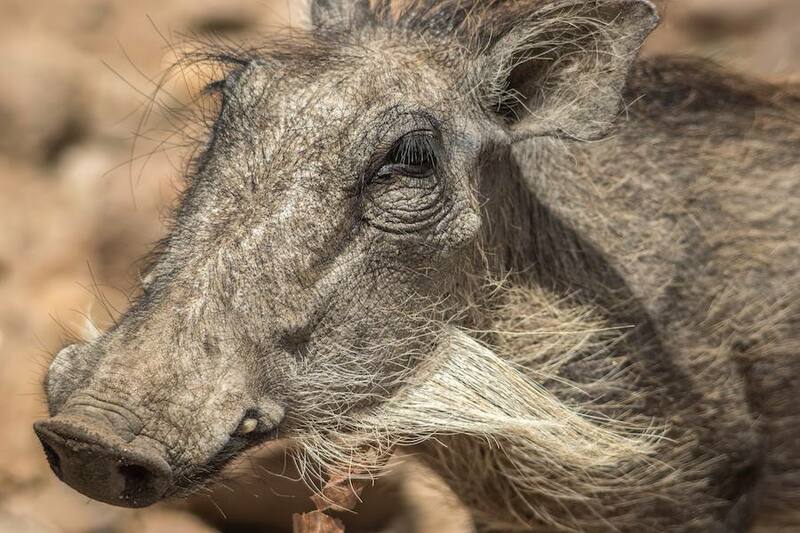 Sparse bristles cover the warthog's body, although longer bristles form a mane from the top of the head down the spine to the middle of the back. The skin is gray or black (or yellowish or reddish, if the warthog has been wallowing in mud). The long tail ends with a tuft of bristles. The warthog characteristically carries its tail upright when it runs, the tuft waving like a tiny flag. As the young run in single file, the tail position may serve as a signal to keep them all together. Warthogs trot with a springy gait but they are known to run surprisingly fast. The warthog has poor vision (though better than most other African wild pigs), but its senses of smell and hearing are good. When alarmed, the warthog grunts or snorts, lowers its mane, flattens its ears and bolts for underground cover.